This is crazy to me: today marks 8 years of blogging. Since 2006, I've created 1,917 blog posts. (This one makes for 1,918.) That's millions of words strung together in an attempt to express thought (sometimes more coherently than others). That's 8 years of developed bloggy friendships, some who came and went. but quite a few who have stuck around and become quite dear to me. That's 8 years which included stints reviewing at 5 Minutes for Books and trips across the country to do bookish things related to the reviewing of books. That's countless reading challenges which have been both successes and failures. Mostly, that's 8 years of learning how to think and working to correct my own bad and misapplied theology. That's 8 years of documentation showing the development of a worldview. There are plenty of embarrassing moments mixed in with some proud ones. That's 8 years of writing out convictions and questioning the way I approach life and people, not just books. Of course, books are the subject matter around here but I truly do hope the center piece has been Christ. I don't know if it is that or not, but if there is less of me and more of Him than there was 8 years ago then I think it has been worth it. This has been a very interesting ride to me. 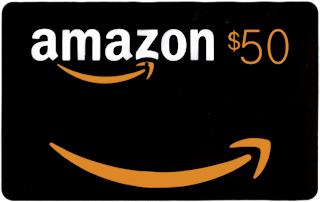 To celebrate a bit, I'd like to host a fun, book-ish contest. It's a little outside my norm, but bear with me. Usually (always and forever) when I host a contest I simply let you leave a comment for an entry. (By the way, I never intent to change that. I like things easy and simple.) But this time I'm giving up something a little bit bigger that is coming directly from me to you and so I'd like to up the ante a bit, if you'll indulge me this once. 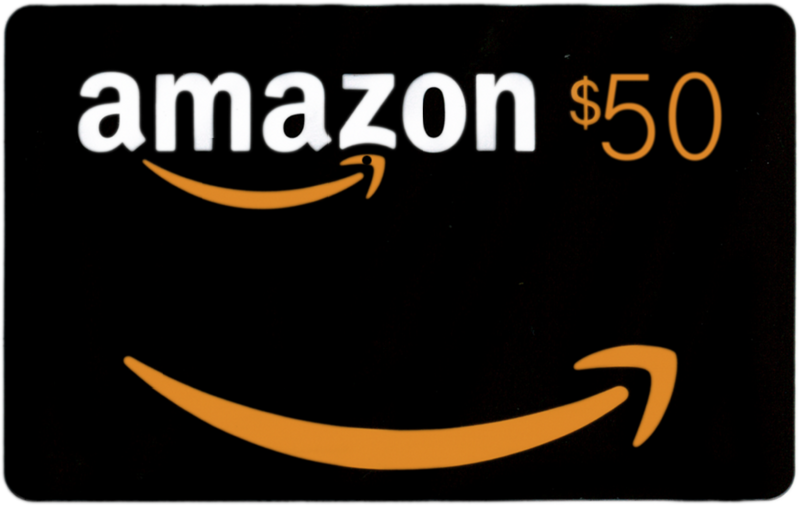 I would like to give away a $50 Amazon Gift Certificate to one of you dear old friends (or possibly a new one?). My Twitter handle is @readingtoknow (easy). Here is the Reading to Know Facebook Page. This contest will be open through Friday, August 8th to give you some time to choose a book and create a photo that you like! It is open to U.S. residents only. The winner will be selected using Random.org to determine the winner based on the comments left on this post. Now, it wouldn't be fair to request a photo of you unless I agreed to share one also. 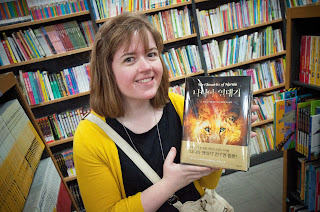 Here is a picture of me with one of my favorite books, translated into Korean! This photo was taken a few months back when Jonathan and I traveled to South Korea. I truly do appreciate those of you who read along and comment. I appreciate the questioning remarks - challenging me to think differently - as well as the encouraging, kind notes you frequently leave. To me this is not just a hobby but a way of working out my thoughts and convictions on any variety of topics and I'm just glad it's included so many wonderful people and wonderful books at the same time! I feel very blessed indeed and if I could bless another just a little in return, that would be enjoyable for me. I hope you'll play along, spread the word about Reading to Know, and keep diving into books alongside me! THIS CONTEST IS NOW CLOSED. THE WINNER, as selected by Random.org, is #10 - Stephanie from Simple Things! Congrats!! Ok, I'm on this one! (And if this messes up your comment numbering, I'm sorry!). But I have to know--are you in a bookstore or library in Korea? Knowing you, I'm guessing the former, not the latter. Congratulations on 8 wonderfully inspiring (& inspired!) years! Many, many more! This year marked my 7th year. I began in January 2007 with blogging over at Wordpress, migrating to Blogger in the spring of 2007. Blogging, reviewing, is a work in progress, an education. Thank you for your service in reviewing and blogging! 8 years! EIGHT YEARS! CONGRATS!! I want to do this. I mean, who wouldn't want that card. Also you look so pretty in that picture. I remedied the situation--thanks, Carrie! Happy 8 years! I'm so glad I've found your blog since I've gotten some good ideas from it, and you've made me think some, too. I chose to go with a series. I put on a shirt from one of my Trixie Belden conventions and took a picture in front of my paperback Trixie Belden collection. I have multiple favorites (Narnia would make the list as well), but Trixie will always have a special place in my heart because of the friends I've made thanks to that series. Contrats! I have enjoyed reading many many of your posts! I posted my photo at bekahcubed. I certainly have loved and appreciated your site. I chose "one" book, just one, aren't you proud of me? I have thought and thought and really couldn't decide on a favorite book (i.e. adult vs. childrens), so I chose instead my favorite book from my childhood. As a young child I asked my parents to read Caps for Sale to me so many times that I memorized the story. For a time my mother had a tape recording of me "reading" it aloud before I could really read. It has become a favorite read aloud for me as a parent and I consider it the spark that started my burning love for books. P.S. The bookshelf Caps for Sale is resting on is in my youngest's bedroom. My husband built the honeycomb bookshelf and it currently is chock-full of our favorite picture books. P.S. I should have added that the reason I couldn't decide on a favorite adult book vs. childrens book is that I have too many. I could do a top 10, maybe a top 5, but just ONE? Hard task. I finally got mine posted. Whew. I am glad you gave us so long to get this done! Congratulations on 8 great years of reading and reviewing. I love peeking into your world through the books you read. I shared on FB the photo of my two favorite books. Do you already know which ones I am speaking of? I posted my picture! I hope it worked. Do you see it? This is such a fun idea! Here's my pic and happy anniversary!! Happy Anniversary! I couldn't pick just one book!! It's so neat that we began blogging within a couple of days of each other. I think I first discovered you through the Nightstand posts or when you were contributing to 5MFB. I enjoy reading your thoughts! whoops, I missed it! LOL Tooooo many things going on here! :) Fun idea though!